Overall, I’m really suspicious of most anything that’s a loaf if it isn’t bread. Something about it just seems wrong, somehow. (And it completely defies my imagination to think about why the rock artist Meat Loaf ever chose that as his stage name. I mean, seriously??) But, at the end of that particular day, mixing the meats up with some spices and just shoving them into a bread pan was about all the dedication to the culinary arts I could muster. So, meatloaf it was. Let’s just say I was being retro-chic. And, besides, something doesn’t become a classic piece of Americana for absolutely no reason. 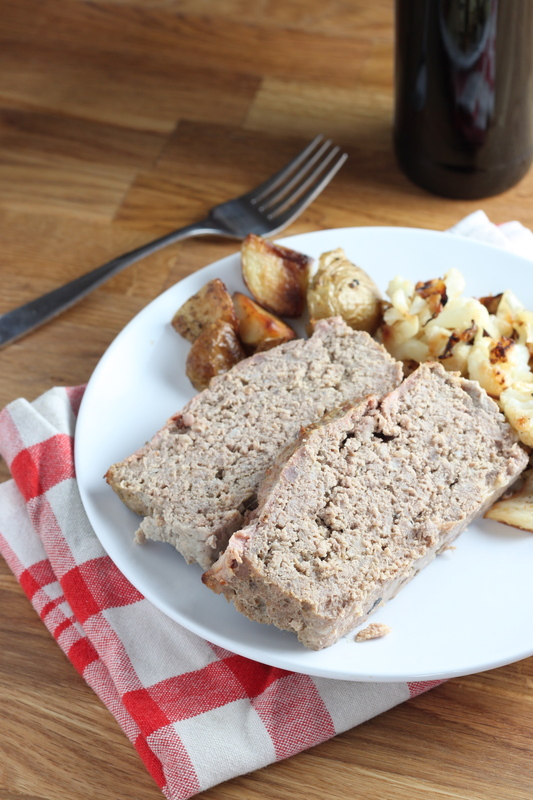 When it comes down to it, meatloaf is incredibly easy, and there is no law on the books saying it has to be a bland, heavy lump of meat. You can go ahead and make it as flavorful as you please! And I discovered that if you start with good quality meat it really doesn’t take much to make a scrumptious and satisfying supper. I took the spices I would have used if I had made the meatballs and blended them into the meatloaf instead. I added in some ketchup and mustard – if they’re good on a burger, they should be good in a meatloaf, right? And then I threw some bay leaves on top to perfume the loaf as it baked. At dinner I felt a little like June Cleaver, traipsing out with a meatloaf, roasted potatoes, and cabbage on a platter. Ah yes, what can I say. I am simply an embodiment of good old fashioned American values. I should have put on a dress with a Peter Pan collar and a frilly apron. Ha. Well, what I can actually say was it was delicious. And I have been eating the leftovers everyday now since Monday. Thank goodness a slice of meatloaf on bread with some mustard and caramelized onions makes a heavenly sandwich! Preheat your oven to 350F. In a large mixing bowl combine the bread crumbs and milk and allow to stand for a minute. Add in the meats, eggs, garlic, spices (including salt and pepper), ketchup, mustard, and bacon (if using). Blend everything together for a couple of minutes with a handheld mixer. (You can also combine it by hand, but I liked the lighter texture from using an electric mixer). Grease a loaf pan and pack the meat mixture into it. Alternatively, if you like more crust around the outside of your loaf, you can grease a shallow baking pan, then form the meat into a sort of oval log shape and place it into the pan. Press the bay leaves into the top of the loaf. This is basically how I do meatloaf (minus the pork), but I like to sneak veggies into mine since I have a picky hubby and a 3 year old. I also make mini-loaves since we love crust…mmmmmm. One time I stuffed with some little chunks of string cheese for an ooey-gooey surprise. Yeah, I like to sneak in vegetables sometimes too. No one terribly picky to deal with, but I just like the flavor they add! Love the idea of mini-meatloaf, that would be cute. To give it more crust, I also sometimes like to form it into a log and just bake it free-form on a baking sheet. 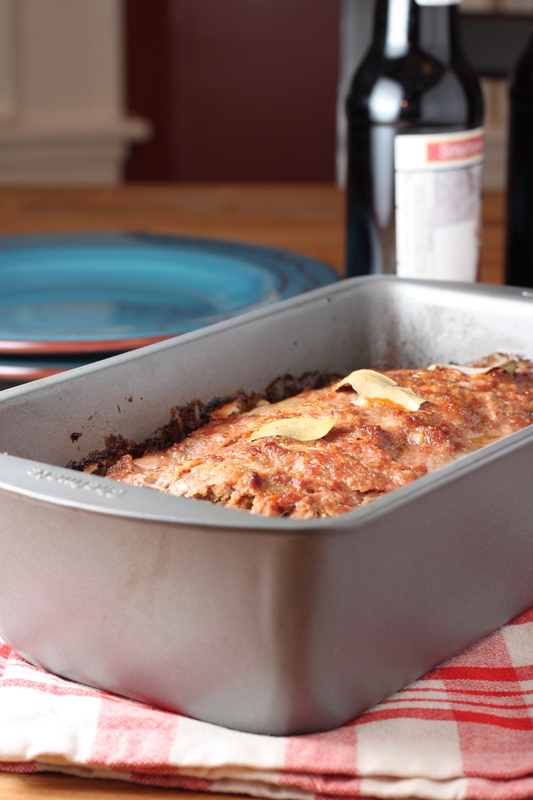 You are currently reading Simple meatloaf at Five And Spice.